Provide clean drinking water by digging water wells for the community. and training of health personnel. To provide educational and vocational training. to improve food availability and security. To strengthen the churches through capacity building and training of pastors. To offer emergency relief to war affected persons. To establish communication networks through satellite guided programs. To improve information sharing among stakeholders through civic education and advocacy. To help the communities attain self sufficiency through sustainable development. In 1955, southern army officers mutinied, sparking off a civil war between North and the south Sudan, led by the Anya Nya guerrilla movement against the Sudanese government. The conflict only ended when the Addis Ababa peace agreement of 1972 accorded the South a measure of autonomy. Over 1.5 million South Sudanese were killed or died from war related causes. But, in 1983, the South, led by the Sudan People’s Liberation Army (SPLA) and its political wing, the Sudan People’s Liberation Movement (SPLM), again rose in rebellion when the Sudanese government cancelled the autonomy arrangements. Over 3.5 million people lost their lives from war and war related causes and more than four million were displaced in the ensuing 22 years of guerrilla warfare. Large numbers of South Sudanese fled the fighting, either to the North (not by choice) or to neighboring African countries, Europe, United States, Canada and Australia, where many remained today. Kenneth Elisapana was born in Jambo village, Western Equatoria in Southern Sudan. As a Southerner, he was subjected to unimaginable suffering at early age. Like many South Sudanese, Kenneth’s story is a story of survival and hope after witnessing firsthand the horrors of war that caused the loss of millions of lives. In an act of survival and in pursuit of better future, Kenneth fled Sudan after he lost his father. In early 1990’s the Sudan government made it difficult for South Sudanese to travel to neighboring countries in fear that they will join the Sudan People’s Liberation Army (SPLA). As a result, millions of South Sudanese were forced involuntarily to migrate north where thousands still live today in deplorable condition with no running water, health facilities, or schools in slums on the outskirts of Khartoum, the capital of Sudan. In February 1992, Kenneth fled to Egypt the only way to get out of Sudan. After spending two years under most difficult circumstances with will to survive, in 1994 Kenneth was sponsored by an Anglican Church in the United Kingdom (St. Peter’s in East Gate, Lincoln) to pursue his studies in Kenya. From there, he was able to come to the United States in 1999. Kenneth earned BA in Sociology from Taylor University, Upland, Indiana, U.S.A, 2002, BA in Community Development from Daystar University, Nairobi, Kenya, 2003, and Masters Degree in Public Administration & Policy Analysis, Southern Illinois University, Edwardsville, Ill, U.S.A. 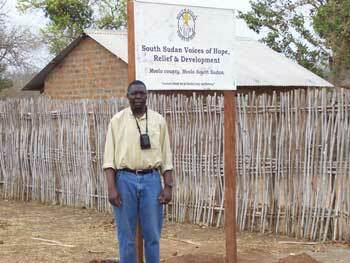 While in the United States, Kenneth founded South Sudan Hope N.F.P. : a humanitarian organization to help his fellow countrymen left behind in South Sudan, with the support of American friends and concerned citizens. Kenneth is currently working for Illinois Department of Human Services (D.H.S.) and creating awareness, mobilizing resources to provide humanitarian and sustainable development projects in his native country.